Skwish Classic Wooden Baby Toy is a one of a kind multi award winning rattle and teether toy. This cleverly designed toy "Skwishes" and returns to its original shape, with beads that slide and rattle. A wonderful multi-sensory toy that reacts to your babies touch. The Skwish helps develop gross motor skills such as grasping and reaching. The elastic cords not only allow the Skwish to flex but also stop your little one pushing the rods and beads to far into their mouth. Awards: 2016 Cribsie Award Finalist, biggest fun for small hands. Material: Sustainable Rubberwood and Elastic, Non-toxic water based finish. The Skwish meets or exceeds EN71 and CPSIA safety regulations. 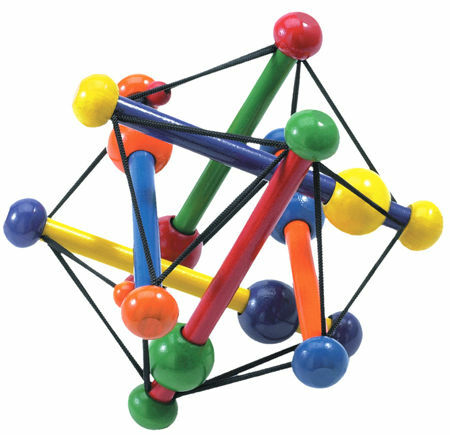 We like this because: "An exceptional toy which our now 14 year old daughter was mesmerized by as a baby."